Slightly noisier as compared to other shavers (due to its 14,000 CPM motor). Panasonic came up with their Arc5 line of foil shavers to counter the insurgence of Philip’s immensely popular rotary shaver models, and while doing so they held nothing back to fully load the Arc5 razors with all the features a premium quality electric razor must have. The Panasonic foil shavers are widely considered to be better electric shavers than their competitors in the foil shavers category (Braun’s Series 7 models), as well as the best of the rotary shavers by some (Philips Norelco models come to the mind). They sport five Nanotech blades, exhibit superb maneuverability and have some incredible motor power and controls to deliver that closest shave, with minimum effort. 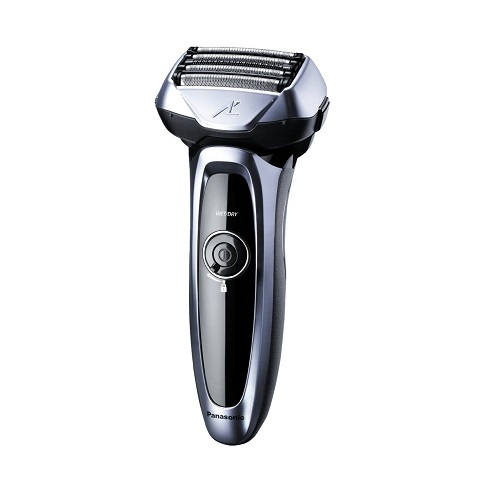 The ES-LV65-S is a premium, cordless Arc5 shaver with some of the latest technologies to boot. It has five precision-based, hypo-allergenic NanoTech blades, a powerful 14,000 cycle per minute motor, an active shaving sensor that detects the various beard densities and adjusts cutting power as required. It has a sleek build (albeit with a large head to accommodate its 5 blades), which fits comfortably in your hands and a LCD panel to display various shaver functions (battery status, cleaning info). It can be used for both dry/wet shaving purposes, and comes with a sonic vibration cleaning mode, which shakes off any clogged hair/gel in the blades. For those who travel a lot, the ES-LV65-S also comes with a safety lock and travel pouch. 1) Arc5 Shaving System – The Arc5’s five blade technology works as a vacuum cleaner for hair and provides a sharp, close shave. It works excellently with all length and densities of beards (whether a short stubble or thick, dense, full-grown beard), thanks to its high precision NanoTech blades which are honed to a 30 degree cutting angle. However, the bulgy head does make it slightly awkward to wield, especially while shaving close to the sideburns. 2) Multi-Flex Pivoting Head – This feature allows the ES-LV65-S to reach all those troubling areas of the face without much hassle. The pivoting head is so designed as to effortlessly glide, flex and pivot along the difficult parts (like the neck, under the chin and the jawline). Although, all the Panasonic foil shavers come equipped with a multi-flex pivoting head, the ESLV65-S has a much faster and a more flexible head as compared with others. You also have the option to use a built-in precision trimmer built at the back of the head, for your moustaches and side-burns for that perfect finish though. 3) Active Shaving Sensor – There is a new, “Active Shaving Sensor” which is capable of detecting the difference in densities of beard hair across various facial contours, and sets the power flow to the blades accordingly to accelerate when cutting the thick beards and soften up when going through a low density stubble. This particular feature makes the ES-LV65-S the best in its category to cut down thick, dense beards according to us. 4) 14,000 CPM Linear-Drive Motor – The Panasonic ES-LV65-S is equipped with a 14,000 cycles per minute linear drive motor (like the more expensive Panasonic ES-LV95-S), which is 40% faster than most other foil shavers (which generally have a 10,000 CPM motor). A faster, more powerful driving motor means a faster and smoother shave. The ES-LV65-S cuts down thick/long beards without any hassle or undue impact on the skin. Combined with the Active Shaving Sensor technology, the 14,000 CPM motor is designed to work at its highest efficiency level throughout its battery life. 5) Flexible Micro-Foil Patterns – Since the Panasonic ES-LV65-S is a foil shaver, it is equipped with three micro-foils which instantly capture, hold and cut different types of hair. These three foils are entrusted with 3 different tasks -: The distinctly patterned Lift-Tech foil uses reverse-tapered edges to gently lift and cut the flat-laying hair; The Slit-Blade foil grabs and cuts longer hair, which usually grow in haphazard directions and the Finishing foil, which finishes off the cutting job by capturing the extra-thick and stubborn hair to ensure a smooth shave. Furthermore, all the foils are moulded in an arc shape, so as to provide the maximum coverage area while shaving. 6) Wet/Dry Shaving – The ES-LV65-S is an all-purpose shaver; you can use it for dry shaving as well as while shaving in the shower using a shaving gel/cream. However, while shaving in the shower, do not forget to keep the water running as not doing so may result in the hair clogging up the drain. Also, you don’t need to put too much pressure while shaving with foam/gel/cream, as the razor head itself is a bit bulky and applies optimum pressure while cutting hair. 7) Battery Life – On one hour of charging, the ES-LV65-S gives a running time of 45-50 minutes, which should prove sufficient for most of people. The LCD display on the front of the shaver tells you about the current battery charge status (as well as sensor readings, total running time for each shave and when it is time to clean your blade), allowing you to recharge it on time. Also, as the included Li-Ion battery does not have a memory, you can cut out the charging process prematurely without having to worry about wearing down the battery strength and durability. 8) Travelling Convenience – It has a universal voltage rating which is designed to automatically adjust to any type of power supply you are using while travelling. There is also a travel safety lock (which ensures that the device is not turned on by accident while lying in your bag) and a travel pouch, to keep it safe while travelling. There is an AC charging adaptor included too, to help you recharge the device any time, anywhere. 9) Cleaning and Maintenance – The Panasonic ES-LV65-S has a Sonic Vibration Cleaning Mode, which when triggered ON shakes off all the stuck hair/gel/foam from the blades and the head. The Arc5 razors are all water-proof, so you can also dip them in water or cleanse them under the tap as it vibrates. This sonic vibration mode pretty much removes the need for an additional cleaning system or cartridge as is provided with other shavers. Although, if you really need a separate cleaning system, you can opt for the ES-LV95-S. The Panasonic ES-LV65-S is a definite buy for all its premium quality features and technology. What’s more, it now comes at a 25% discount price which means you will have to shell about $100 less than its original MRP! At $299, it is still a premium product though (almost double the price of Braun’s models) but adding up the incredible shaving experience and the latest technology built in the product, it definitely emerges as a winner. The customer ratings of Amazon and the high critical acclaim it has garnered worldwide lay enough credentials to the ES-LV65-S for you to consider buying if you are OK with that costly tag. Previous post: Shaving Against The Grain – Do or Don’t?